Crispy. Crunchy. Golden brown. No frying necessary. Egg free. Brussels sprouts! We have surpassed what I thought was possible with these little mini cabbages and we have entered new territory. I think these technically count as oven fried brussels sprouts. In the meantime, this recipe is my –new- favorite way to eat brussels sprouts. We’ve eaten these 3 times in the past week and I fall deeper in love every time. They’re delicious as a brussels sprout side dish, or in lettuce wraps, or doused in a sticky sweet sauce. They’re just damn good. And, wait for it… THEY’RE EASY! 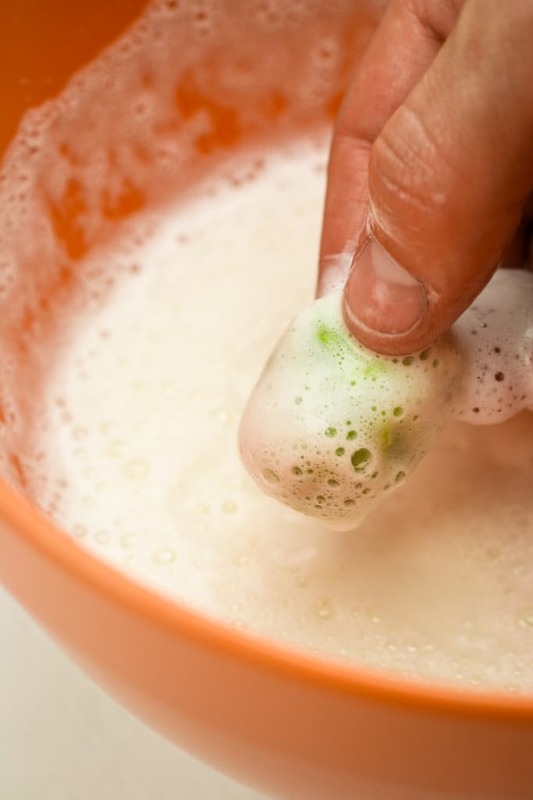 Whip the aquafaba (which is just the liquid from a can of chickpeas) and whisk the breading in two separate bowls. Then dip brussels sprouts in the aquafaba, then coat in the breading. 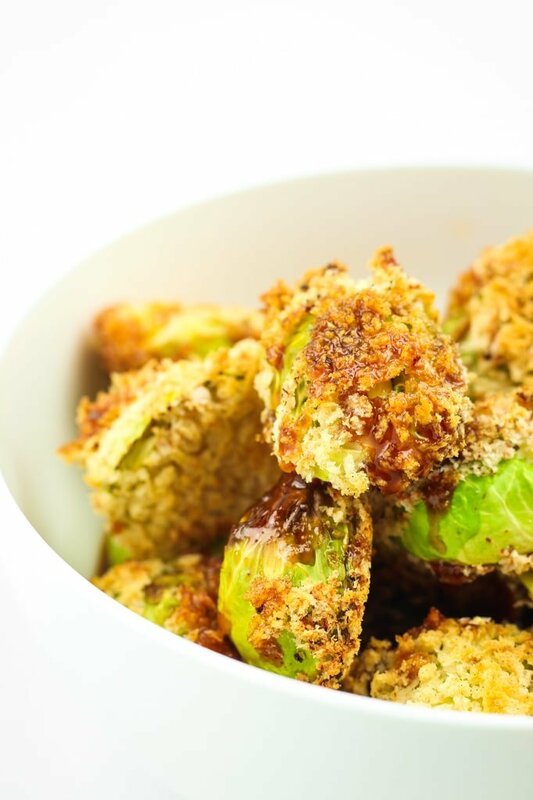 Bake for 30 minutes and enjoy the crispiest brussels sprouts your mouth ever did taste. With that all being said, I’m going to finish off the sheet pan of these and get packing. We’re heading out for a little midweek camping getaway. Temps are gonna be in the 70’s and the sun is gonna be out. Helllllooooo, spring! 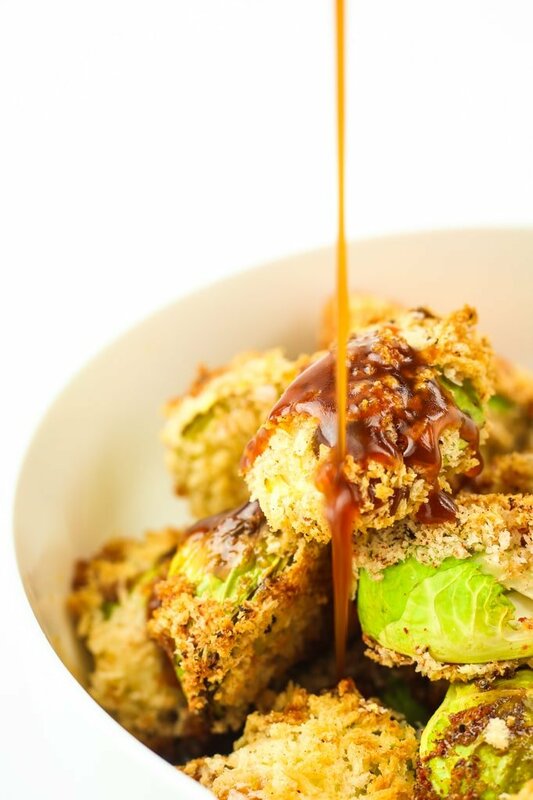 When you make these crispy brussels sprouts, share a picture on your Instagram and tag us! 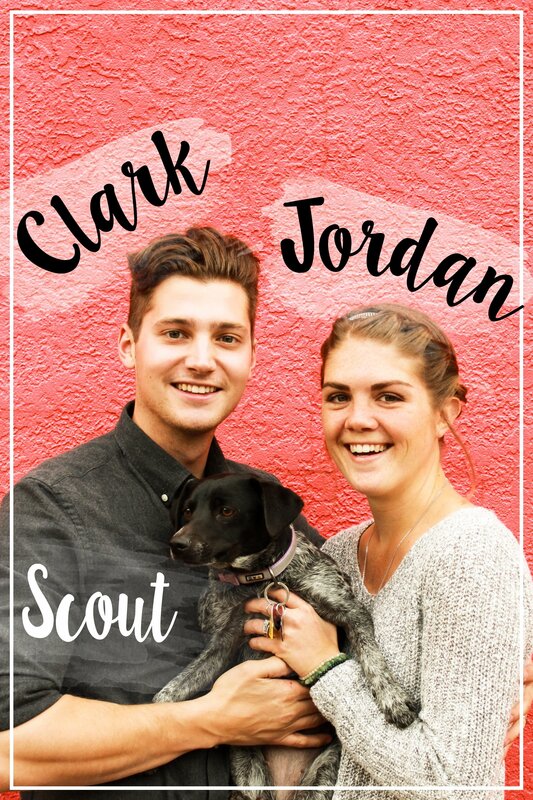 We’ve been sharing some awesome reader creations in our stories lately. AND/OR leave a comment below telling us whatcha think. I’ll love you either way! Preheat oven to 425º and line a baking sheet with parchment. In a small bowl, whisk together panko, salt, paprika, and pepper. Add all sauce ingredients to a small mason jar and shake to combine. You can also whisk everything together in a bowl. I’m not a fan of Brussels Sprouts, but my wife loves them. I made a double batch for her and she absolutely loved them. She was happy that she didn’t have to share with me. The only tweak I think I might make is to bake them on a lubed cooling rack to potentially eliminate the need for flipping. Is there anything I can use instead of aquafaba? Yep! You can use beaten eggs instead. We love brussrl sprouts and I always look for new ways to make it. Thank you so much for sharing this recipe. 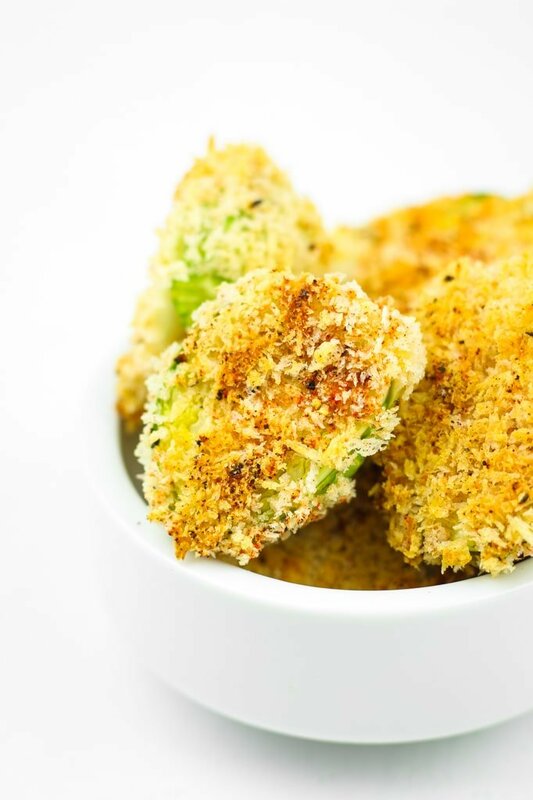 Panko makes everything super crispy. We love it! And the idea to use aquafaba as the egg substitute is genius. 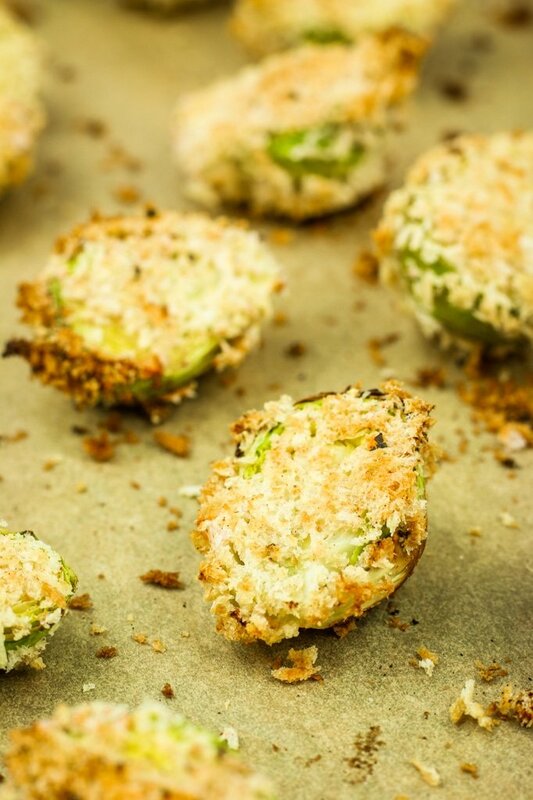 They look yummy, another great brussel sprout recipe! Brussel sprouts are quickly becoming one of my favorite sides, and it’s exactly because of recipes like this. This looks amazing, crispy and all sorts of delicious! I made this as a side dish with our dinner tonight….not even an hour ago and this was loved by the entire family!!! Even my 10-year-old niece who hates vegetables ate them! Perfection! What a fantastic way to prepare Brussels sprouts! They are one of my favorite vegetables and I’m going to give your recipe a try soon! I love brussels sprouts in pretty much every shape and form, but putting them in the oven is the absolute best. When they get nice and soft on the inside and retain their crispiness on the outside – completely delightful! Great recipe! 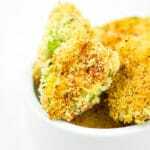 OMG I love Brussels sprouts just about any way I can get them and this breaded version looks so good!! Thank you for this recipe. Sounds wonderful. Love those Brussels. Wow sounds amazing! Thank you! 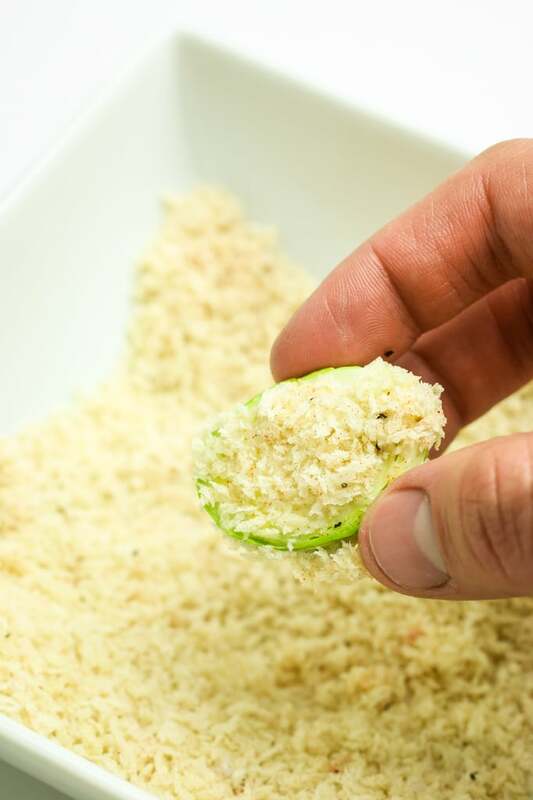 Can regular gluten free bread crumbs be used ? Having trouble finding GF panko breadcrumbs. Absolutely! Either type of bread crumbs will work. Brussels sprouts are awesome. My wife is trying to grow them in her garden for the first time this year. Also, I never even thought about using aquafaba as a breading base. What a great idea! i usually make brussel sprouts in the oven, like simply roasted but you have taken it to a whole another level. LOVE IT. I love Brussel sprouts and crispy sounds even more perfect. My kids would love this. Saving for later. Got to try this soon. I love bussel sprouts. This recipe is pure genius. I love that you’ve used aquafaba in place of the egg to make this vegan. I will have to give this a try. Okay, truth: I don’t like Brussels Sprouts, BUT hubby does and looks at me with big puppy dog eyes wanting me to make him some! How can I resist that? So, I will be making this delicious recipe to appease him and I will taste it just to see if my tastes have changed since the last time I ate some Brussels Sprouts! He is going to love your recipe. I can just tell!